We love our bears in the Lake Tahoe area.that is until they break into our homes and create no small mess! 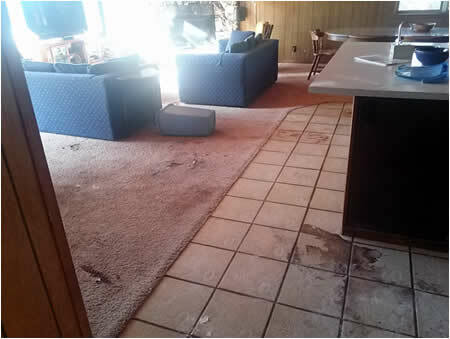 Over the past 12 years, Summit Cleaning Services has been called out numerous times to clean up after the mess these hungry creatures make in a home. These can result in the most challenging of cleaning situations a carpet cleaner can ever encounter. Typically, these bears make a bee line for the refrigerator and pantry areas of the home.and no, they do not eat at the table using plates and napkins.nor do they use the toilet! Fortunately, state-of-the-art technology, experience, and a bit of luck have enabled us to achieve some pretty remarkable cleaning results. This is especially true when the mess happens on well maintained carpet or tile that still has significant stain and soil resistance properties. Occasionally however, the mess left behind is beyond what even the best cleaning technology can remediate, and/or is beyond what makes financial sense. In these cases, a Summit Cleaning Services' consultation can help determine what the best course of action is by testing the cleaning potential of various soil and stain conditions and providing a cost/benefit analysis.